Check the amount of coolant in the reserve tank. 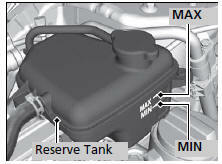 If the coolant level is below the MIN mark, add the specified coolant until it reaches the MAX mark. WARNING Removing the reserve tank cap while the engine is hot can cause the coolant to spray out, seriously scalding you. Always let the engine and radiator cool down before removing the reserve tank cap. NOTICE Genuine Honda engine coolant is a 50/50 mixture of antifreeze and water that can withstand freezing at temperatures as low as about −31F (−35C). If your vehicle is consistently subjected to temperatures below this, the concentration of antifreeze in the coolant should be increased. Consult a dealer for details. If Honda antifreeze/coolant is not available, you may use another major brand of non-silicate coolant as a temporary replacement. Check that it is a high quality coolant recommended for aluminum engines.